In Spring and Fall seasons, ABYB is divided into grade and age-based divisions. The Spring season normally runs from April through June. Practices typically begin during the first few weeks of April, and games usually start towards the end of April. Spring baseball most often finishes the weekend before school ends. The Fall season typically starts with practices in late August/early September and then games starting usually after Labor Day and continuing each weekend through October. The information below will help you understand what to expect at each level. For Summer Baseball, refer to the Summer Baseball page. For this division, it is the expectation of the league that each child has a parent/guardian/responsible party present during all practices and games. Please let the coach know if this person will be anyone other than the parent. Coaching instruction by parent volunteers, teaching the basics of baseball: an introduction to batting, fielding, throwing, base running, and defense. This division emphasizes participation, learning and having a fun team sports experience. Therefore, wins/losses and team standings are not recorded. One weeknight practice on the same night each week, lasting 60-75 minutes. One 3-inning game per week on Saturdays, lasting 70-90 minutes. (If games rain out, make-ups might be scheduled on Sundays or on weeknights). Practices and games are primarily at Douglas School with 45- to 50-foot base paths. Each player bats once per inning, 3 times per game, hitting from a batting tee. Players play all defensive positions during the season but players do not pitch and catchers are not in full gear. Coaches and players are assigned to teams by the T-ball division coordinator. Coordinators typically try to group schoolmates together if possible. Players receive team shirts and hats and an end-of-season participation trophy. In the Fall, the T-Ball division is sometimes combined with Minor C depending on registration numbers in each division. Coaching instruction by parent volunteers, teaching the fundamentals of batting, fielding, throwing, defense, and base running, with an emphasis on fun as players develop. This division emphasizes continued learning and having a fun team sports experience. Therefore, wins/losses and team standings are not recorded. One 3-inning game per week on Saturdays, lasting 70-90 minutes, possibly with make-up games on Sundays or weeknights if games get rained out. Practices and games are primarily at McCarthy-Towne School with 50-foot base paths. Each player bats once per inning, 3 times per game, with a coach pitching. Some players may be required to bat from a batting tee after 4-6 missed swings. Players play all defensive positions during the season. Pitchers do not pitch but field, and catchers retrieve pitches from the coach. Coaches and players are assigned to teams by the Minor C division coordinator. Coordinators typically try to group schoolmates together if possible. 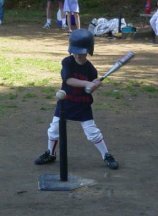 In the Fall, the Minor C division is sometimes combined with T-Ball depending on registration numbers in each division. Coaching instruction by parent volunteers, teaching the fundamentals of batting, fielding, throwing, defense, and base running. Coaches introduce pitching and catching at this level, as well as defensive strategy. As always, there is a focus on fun in a structured team-oriented environment. Scores are kept during games, but standings are not kept. The Division Coordinator assigns coaches to teams, and players are assigned to teams during a player draft, with a goal of creating balanced teams. One weeknight practice on the same day each week, lasting 60-75 minutes. One 6-inning game each Saturday, lasting 90-120 minutes, with potential additional games and make-up games on Sundays or weeknights. 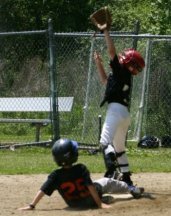 Games and practices are held primarily at Liberty Field and occasionally Flerra Field (both in Boxborough) with 60-foot base paths (standard Little League field dimensions). An inning ends after 3 defensive outs, scoring 5 runs, or if all batters bat in an inning. Batters hit coach-pitch (with swinging strikeouts) for the first 4 games of the season and a blend of coach-pitch and player-pitch (with swinging and called strikeouts and walks) for the second half of the season. During player-pitch, a coach or another volunteer serves as umpire. Players play most defensive positions during the season, with pitching and catching introduced. The Minor A division is for some of our third-grade, all fourth-grade, and some fifth-grade players. Third graders and fifth graders are assigned to Minor A based on player evaluations by coaches. Coaching instruction by parent volunteers, teaching batting, fielding, throwing, defense, pitching, catching, and base running. Coaches introduce offensive and defensive strategy. In the Minor A level, scores are kept which provides strategic opportunities in some games, but records are not kept. One weeknight practice each week, lasting 75-90 minutes. One or two 6-inning games each weekend, lasting 90-120 minutes, and possibly a few weeknight games during the season. An inning ends after 3 defensive outs or when all batters have batted in an inning. Games and practices typically are held at MacPherson Field (Conant School) and Flerra Field with 60-foot base paths. Players pitch from the mound (strikeouts and walks) and are limited by pitch counts and innings per game. For the first time, batters can bunt and runners can steal once the pitch crosses the plate. This allows the pitcher to concentrate on pitching and allows the offense and defense to be more dynamic than in younger divisions. With a live ball, catchers become an integral part of the game. Game savvy is valued. Players play most defensive positions during the season. During the season coaches endeavor to ask most players to pitch in a game, however some players might not pitch during the season. ABYB assigns junior umpires to officiate Minor A games. Players receive team shirts and hats. In the spring, players receive an end-of-season participation trophy or other giveaway (TBD). The Majors division is for some of our fifth-grade and all sixth-grade players. Fifth-grade players are assigned based on coaches' evaluations of players. NEW FOR 2019: 7th grade players are no longer eligible for Majors. Coaching instruction by parent volunteers, teaching batting, fielding, throwing, defense, pitching, catching, base running and situational strategy. At this level there is an increased focus on strategy and teamwork. 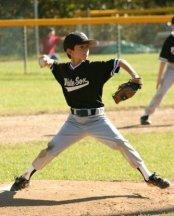 NEW FOR 2013: 9 year-old 3rd-grade players who were selected for the BayState C Summer All-Star team (and played a minimum of three games during the BayState season) will be given the option to play in the Majors division as a fourth grader. In the Majors level, scores are kept and posted online. Records are kept and determine end-of-season playoff rankings. (Playoffs are in Spring season only). Two 6-inning games each weekend and possibly one weeknight game each week during the season. Games are time-limited with no new inning starting 1 hour and 45 minutes after scheduled game start. Games and practices are typically held at the two diamonds at Veterans Field with 60-foot base paths. An inning ends after 3 defensive outs. Players pitch (strikeouts and walks) and are limited by pitch counts. Players begin to specialize in a few defensive positions during the season. In past Spring seasons, the Majors division has had an All-Star game and Home Run Derby. ABYB assigns umpires to officiate Majors games. Players receive team shirts and hats. In the Spring, the season ends with playoffs, with the winning teams' players receiving trophies. The Fall season is developmental with the focus on instruction and skill development. In the Spring, Babe Ruth teams participate in the Minuteman League. There is one division for 13- to 15-year-olds. Each team is allowed a small number of 16-year-olds also, as long as they are not playing High School or AAU baseball. Any 16-year-old players have significant limitations on how much they are allowed to pitch. In the past there has been a separate 13's division, for 13-year-olds moving up to the full-sized (90 foot) diamond for the first time. If this division is offered by the Minuteman League, ABYB will consider fielding teams if there is sufficient interest from our 13-year-old players. If so, 13-year-old players may also be given the option to participate in both divisions. 13-15 Year Old Division: Typically play games on the weekends in the Minuteman League. Practice during the week at coaches' discretion. 13 Year Old Division (if offered): Typically play games during the week in the Minuteman League: Patriot Division. Practice on the weekend at coaches' discretion. Games are played on full-sized diamonds at Acton-Boxborough Regional High School with 90-foot base paths, as well as in other towns participating in the Minuteman League. Some players specialize in defensive positions (e.g., catcher, pitcher). There are specific rules for playing time and pitching that all teams in the Minuteman League follow. See www.mmbrl.com for more info. 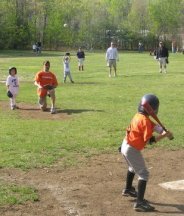 In the Fall, Babe Ruth teams participate in an ABYB league that follows Minuteman League rules with some local modifications specific to the fall season. Players from neighboring towns without a fall program are also allowed to participate.